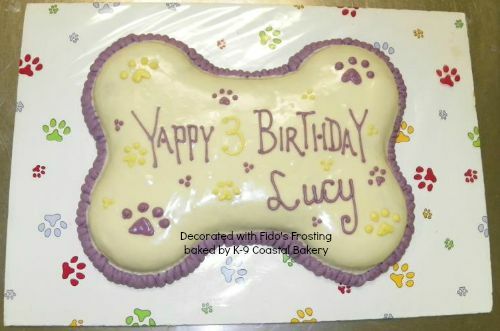 Follow these ten simple baking tips to bake a dog cake and have it turn out looking like it came from a dog bakery. Prior to putting your cake in the oven, make sure the oven temperature is where it should be by preheating for 10-15 minutes. This ensures even baking. 2) Grease the baking pan liberally. For the cake to come out in one piece after it's done baking, make sure you grease the baking pan on all sides and in all creases and corners. Even silicone baking pans will work best if pre-greased. Use a non-stick spray, or, use butter/shortening coated with flour if those ingredients do not pose an issue. 3) Use large size eggs. These will give the best results when you bake a dog cake. Use the exact number called for in the recipe. Measure at eye level in a measuring cup. The curve of the top of the liquid should touch the line of the level needed. 5) Bake immediately after mixing. After mixing the batter, pour immediately into the cake baking pan and get it into the oven. Don't let it sit around and settle. 6) Bake a dog cake in the center of the oven. This will ensure even distribution of the heat so that all parts of the cake cook the same. 7) Mix one recipe at a time. If you plan to double up on the recipe, mix it one recipe at a time. It is best not to combine all the ingredients in double amounts. You will have to add cooking time. 8) Test doneness with the cake still in the oven. Leaving the dog cake on the oven rack, pull it towards the edge so you can stick a toothpick or fork into the center. If it comes out clean, the cake is done. Make sure you check several points. Do not take the cake out of the even because this will start the cooling process and disrupt the evenness of baking. 9) Cool the cake before releasing from the pan. Let the cake cool at least 10 - 15 minutes before you take it out of the pan. If you try to remove it in less time, it will be too warm and will crumble. if you leave it in longer, the grease will harden and act like glue causing the cake to stick to the pan. If this happens, return the cake to the oven for a few minutes at 250 degrees to loosen the "glue". A cake board will work well. Otherwise, place a piece of parchment paper or waxed paper on a plate or cooling rack and invert it onto top of cake. Flip the cake pan so the cake falls onto the waxed paper. You can flip it back over by doing the same step.